There are so many wonderful ways to explore color without breaking the bank. Hi, I’m Natasha and I blog over at Tiny Tots Adventures where I share the fun that my girls and I have fun all while learning. When it came time to explore colors with my toddlers I took the fun route. I looked at all the resources that I had on hand to aid me outside of all the store brought toys they had. I found it to be quite easy and fun to put together some of these simple but effective activities. Make a color sorting bucket from an old ice cream tub or coffee can. This was simple to make and has gotten much use for many different activities. Use pom poms, bottle caps, colored foam, or pipe cleaners for sorting. 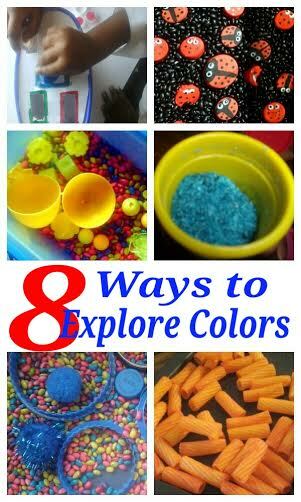 Focus on a single color with a fun and easy sensory bin. With this you can throw in shades of a color for some really fun. Mixing two colors in a bin and let your child separate them into bowls can be fun and frustrating sometimes, but if you make sure that the two colors are two different materials then you can make identifying each color a little more fun and easy. There are some colors that are a close match with another color and I found that providing them with both options and letting them sort them out can be fun. Letting your toddler participate in making specific colored art materials can help them to learn to identify their colors. It will help them to remember the color that they helped make. Focusing of seasonal colors is great fun and helps them to learn cool and warm colors and different tones of a color. Dye some pasta in the colors that you are working in and make some beautiful art, necklaces, and more. Sometimes they really want to help come up with their own color learning activities. This is a great way to gauge how well they picked up learning a color. Well that’s it folks. I hope that in this list that you can find some inspiration for when your toddler is ready to explore colors. Remember it doesn’t have to be complicated. You can take a walk in your neighborhood and see what colors you all can find and bring them home and make some beautiful art that will help then to keep a memory of their color. You can also do something as simple as playing with play dough. Learning colors is so much fun and there are so many opportunities to just pick a color and go from there. What are some ways that you have found to teach your little one their colors?